The LA Dodgers jumped out to an 8-2 start and belted homers in the first ten games of the season during an infectious home run streak, while Cody Bellinger rediscovered his swing by hitting seven home runs. The Dodgers kicked off the season with a huge bang. They hit eight home runs on Opening Day, which set a MLB record. Bellinger hit a homer in the first game, which got him off on the right foot. Bellinger, in his third year with the Dodgers, leads the NL in home runs. He’s tied with Jay Bruce from the Seattle Mariners and Khris Davis from the Oakland A’s for the MLB lead. Bellinger found a little more patience at the plate this season and he’s not swinging at pitches out of the strike zone. His swing is as sweet as its been and he’s been making opposing pitchers pay for their mistakes. The Dodgers hit the road and swept the Rockies in Colorado. The Dodgers scored 29 runs in three games and looked unstoppable. If they could, the Dodgers would have stayed in Denver for the rest of the week to play games because they lit up Coors Field. Dave Roberts and his team flew into St. Louis for a four-game series and their luck drastically changed. The hot bats finally cooled down. The Cards shutout the Dodgers in the second game and allowed only 5 runs in three games. The Cards ended the Dodgers home run streak, which had reached 13-consecutive games dating back to last season. The Cards will be going for a four-game sweep on Thursday afternoon. The Dodgers return home to Los Angeles this weekend for a series against the Christian Yelich and the Milwaukee Brewers. Paul Goldschmidt, the newest member of the Cards, hit 6 home runs already and trails Bellinger by one homer. 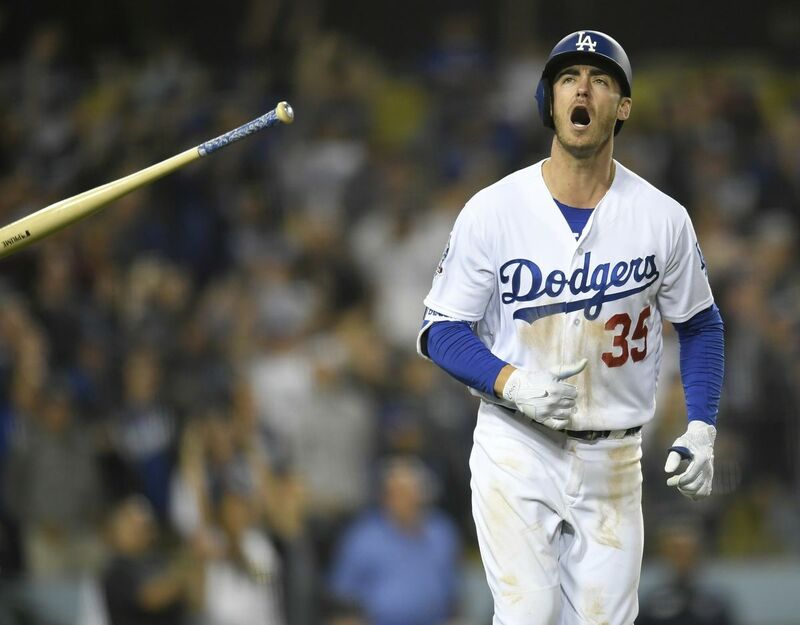 During the Dodgers hot streak, Cody Bellinger jumped to the top of the Triple Crown categories. He led the NL in hitting with a .435 average and belted 7 home runs and 19 RBI. Bellinger is currently at .426 and slipped to second in overall batting average. He’s a career .271 hitter over his first two seasons, but he’s been knocking the snot out of the ball as Phil Rizzuto would say. Most importantly, he cut down on strikeouts. Bellinger has six in 12 games. He struck out 146 times as a rookie and 151 times last season. Bellinger surprised everyone during his rookie season in 2017 when he it 39 HR and 97 RBI in 132 games. He also ho 30 extra base hits. During his sophomore season in the big leagues, Bellinger played the entire season but struggled at times. He hit 25 homers with 76 RBI, but didn’t look anything like his rookie season. He had a poor postseason and hit only one home run in 16 games. Bellinger also hit .115 as the Dodgers lost to the Boston Red Sox in the World Series. According to the South Point Casino and Sports Book in Las Vegas, the LA Dodgers are 6/1 odds to win the 2019 World Series.